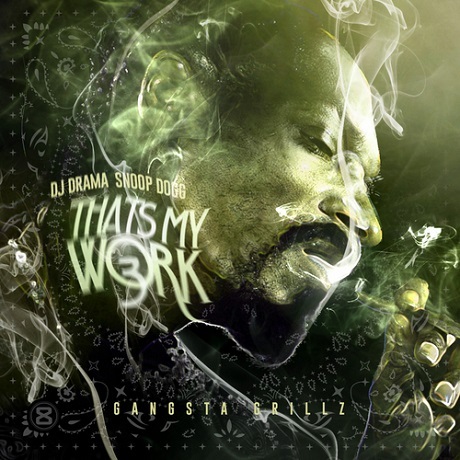 After spending the last few months getting funky as Snoopzilla in 7 Days of Funk, Snoop is hitting back as the D-O-double-G with the third instalment of his That's My Work mixtape series. P-funk grooves are still de rigueur for the big Snoopy D, who lays down his patented, soft-spoken bars atop the synth wriggle of "Pop Pop Bang" or the '80s swerve of the Madlib-produced "Cadillacs." The DJ Drama-hosted tape also features Snoop spitting alongside Warren G and T Fly on the West Coast- and women-saluting, snap-driven "Never Had It Like This," and brings out Daz for a handful of tracks. You can stream/download That's My Work 3 down below.